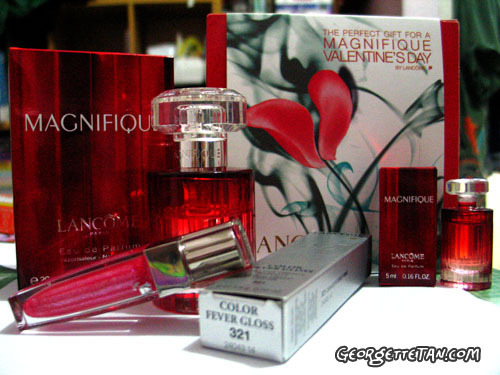 A few months ago, I bagged the last gift pack for Lancome’s Magnifique at Riverside Majestic’s Lancome counter. It contained a 30ml bottle, a 5ml vial and a glittery pink lip gloss. The fragrance that celebrates her vibrant femininity, her joie de vivre. Infused with the spicy impertinence of saffron, the warmth of roses and the smoky embrace of exotic nagarmotâ wood. I’m very very picky when it comes to getting perfume. A lot of it just evaporates and leaves a powdery smell on my skin in the space of 15 minutes. That or I don’t like it any more past the top note. My last perfume was Lancome’s Miracle Forever. After that, it was about two years of sampling perfume when I feel like it (which was not very often), with little luck. At the beginning of this year, I picked up The Body Shop’s Love Etc, which had top and middle notes that I liked. But once it stayed on the skin all day and mingled with sweat, it started to smell like one of my last perfumes which I fell out of love with. I found my current perfume not long after and found a buyer for Love Etc. The reason why I’m even blogging about this is because I found the gift box while cleaning out my makeshift dressing table. What is it about product boxes that make us girls hang on to them even if they’re no more use to us? A photo of it will do the same thing. I certainly takes up less physical space!